During Tech Field Day Extra at Cisco Live Europe 2017 one of the presentations we attended was from Paessler, about their PRTG monitoring tool. I had only seen it once before, during a penetration test I performed at a customer site – and since it was running with default credentials it gave a very nice insight into the IT setup they had. 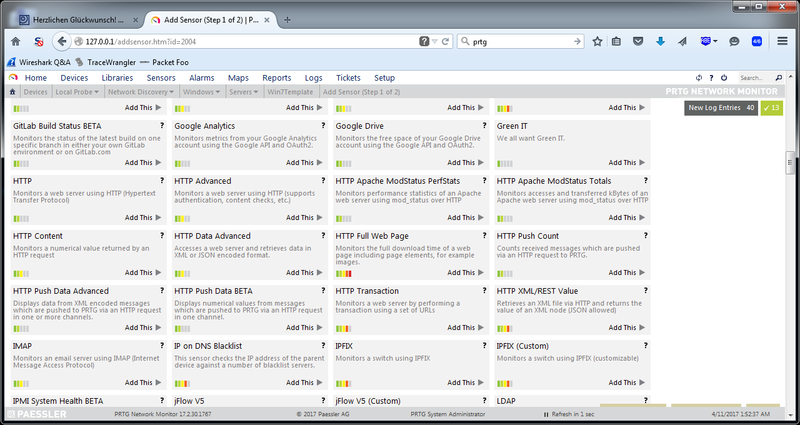 But so far all my monitoring I had setup myself had been via Nagios or Icinga. 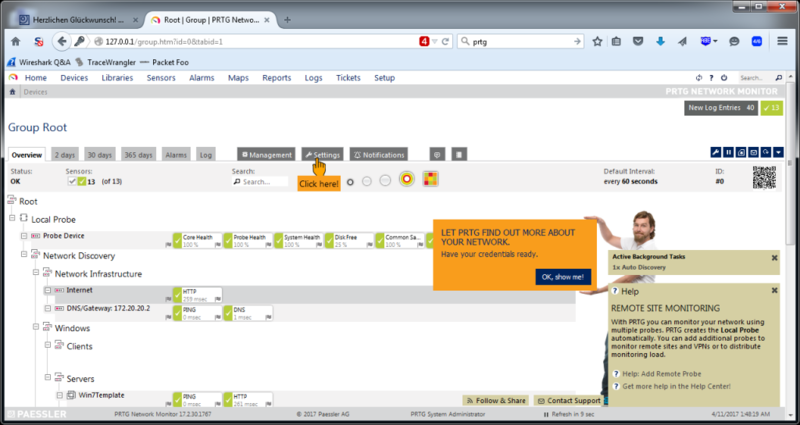 So after the presentation I wanted to check out PRTG myself and installed a test version. After letting it run for a while I had seen enough to write a blog post about it. PRTG runs on the Windows platform only, which means that right now some of my readers are probably mumbling something like “Windows? Gotta run Linux…”. Well, everything has advantages and disadvantages, and of course Windows has the main disadvantage of costing money for the OS license (yeah, and it’s closed source, I know). But on the other hand it’s easy to use, especially if your administrators are used to working with Windows boxes anyway – which isn’t that uncommon for small and medium sized businesses, which is the main customer base PRTG aims at. Having installed Nagios and Icinga myself a few times I have to say that installing PRTG is much easier – run the installer, click through the install options, done. No “apt-get”, “yum” or “dpkg -i” for all the things you need, or compiling from source. Which is all good and fine, don’t get me wrong – but it needs way more background knowledge about how things work in detail compared to a installer just doing all the necessary tasks for you. And if you want statistics collection you need to prepare a database first, which can be a challenge if you’ve never done it before. The interesting thing with the license is that you can run 100 sensors for free, which is a nice offer to get started. For a company that’s probably not going to do the trick, because 100 sensors aren’t that much if you have more than a handful of devices you want to monitor. I also like the “no questions asked” hint, because way too many vendors keep making their test installs so annoying (with forms to fill out about why you even dare to try the product, follow up emails every few days etc.) that it isn’t fun to start a test. 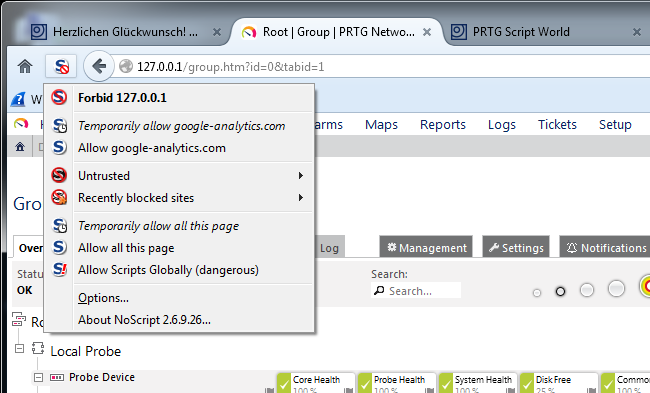 You can see that PRTG monitors the system it runs on (called “Probe Device”), and also adds a check for the availability of the “Internet” (by running a HTTP sensor on “www.google.com”) as well as your DNS and gateway. Every one of those green/yellow/red boxes is a “sensor”, and counts for the license. And that’s one of the coolest things about PRTG – you don’t need to write scripts, or fight with config file parameters to add a sensor. In most situations it’s enough to provide credentials to allow the sensor to read the system values, and you’re done. Monitoring things like the IPMI health status is a breeze, or adding all the VMs on an ESXi hypervisor (though I recommend doing that on the vCenter if you have one, because otherwise monitoring fails when a VM is moved across the cluster members by DRS). Using WMI you can check services on Windows platforms and define if they should be restarted automatically if they’re stopped. And if the predefined sensors aren’t good enough you can build your own or head over to the PRTG script world to find more. There’s no need for the administrator to configure a database for the statistics manually – it’s all done during setup. That’s a problem right there, because now everyone can see you’re running a PRTG installation – and in some cases they’re accessible from the Internet (I checked), with only a login prompt protecting the goods. I can hear someone say “it’s fine, nobody will ever find this. We’re using the totally unexpected TCP port 8443 for this”. Remember, people: security by obscurity fails. every. single. time. And considering the sensitive nature of information inside the PRTG installation (IPs, URLs, Login credentials for WMI/SNMP/virtual environments/switches/routers etc.) a lot of bad guys may be interested and dedicated enough to run their password testing scripts as long as it takes. Of course the exposure of PRTG to the internet is not the fault of the vendor, because it’s the customer who made the mistake – but I guess many of them do not realize that the Analytics script leaks that kind of information about their installation. 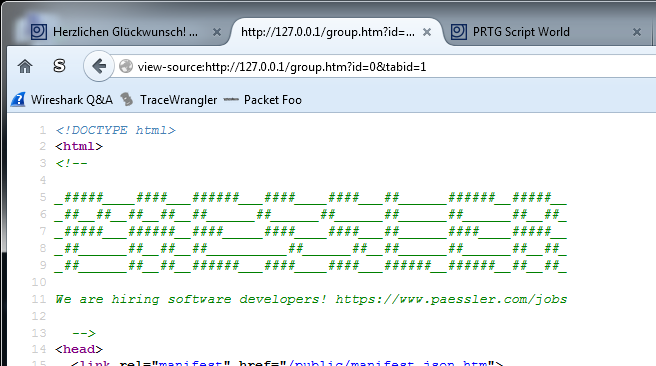 So I contacted Paessler about this issue and they told me that the Analytics is only used during trial to improve PRTG and user experience. As soon as a customer buys a license, Google Analytics is disabled automatically (I couldn’t check because that would mean I’d have to buy a license on my own just for that). Other than that, they highly recommend not to put PRTG in a location where it is reachable from the internet, and I can only agree. PRTG does have a password brute force protection, but you should not rely on that functionality if you can prevent public access at all. If you need to access a tool like that remotely, do it via VPN (running an OpenVPN server via pfSense is really not that complicated). Paessler has a few knowledge base articles to setup reverse proxies for PRTG in a situation like this, but I’d always go for a VPN instead. 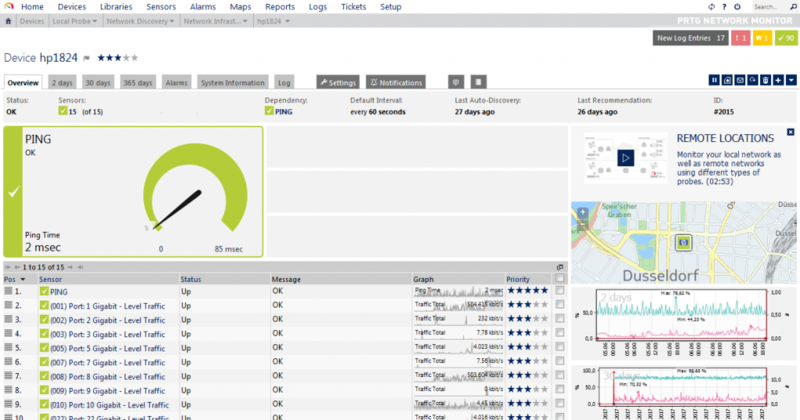 PRTG is a nice alternative to Nagios, Icinga and all the others out there. For a small company that doesn’t have time and money to train their admins to setup monitoring with open source tools it is probably a lot cheaper to use the commercial PRTG version. The learning curve is much easier, and basic monitoring can be setup with skills any admin should already have. The amount of predefined sensors is impressive, offering simple as well as complex checks at the click of a mouse. So in the end Nagios and Icinga may be free, but the learning/having the necessary skill to set it up isn’t – and PRTG may turn out to be the cheaper solution in some situations. I’ll run a free 100 sensor installation for my devices from now on, as it requires less of my time compared to adjusting my existing Icinga installation every now and then. This post is a part of my Tech Field Day post series. I was invited to this event by Gestalt IT. Gestalt IT covered travel, accommodation and food during the event duration. I did not receive any compensation for participation in this event, and I am also not obliged to blog or produce any kind of content. Any tweets, blog articles or any other form of content I may produce are the exclusive product of my interest in technology and my will to share information with my industry peers. I will commit to share only my own point of view and analysis of the products and technologies I will be seeing/listening about during this event. I often use PRTG too. Trial version is very good for monitoring IP video surveillance systems: we can arrange sensors to monitor SMB video-fileserver availability and also some custom status-related webpages of our IP cams. Also I like configurable alert system – you can easily got PRTG to send you emails, push messages and so on based on counters, good/bad status etc. It’s a very flexible system. PRTG also has mobile Android client (probably iOS too, I didn’t check for it). So you are able to receive alerts just instantly on your phone. Thanks, Vladimir! And yes, I tested the Android app as well, which is nice to have as an alert device. 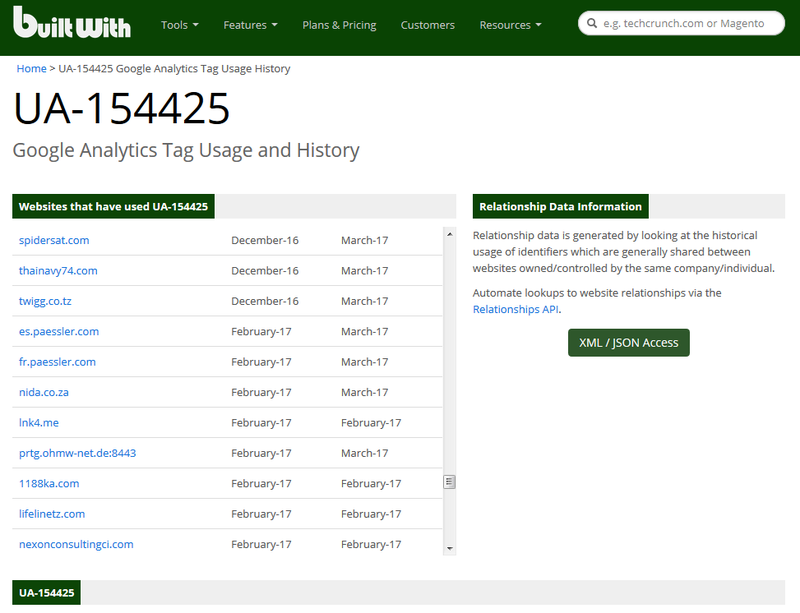 Interesting, we are one of Paessler partner and only get to know the section on the Google Analytics part after reading your post. Never know they would have use that to keep track on trial account. Also another recommended option is to setup a SSL HTTPS on any PRTG installation so that your credentials when login on to the web interface is encrypted. Yes, I fully agree, going for HTTPS is the way to go. 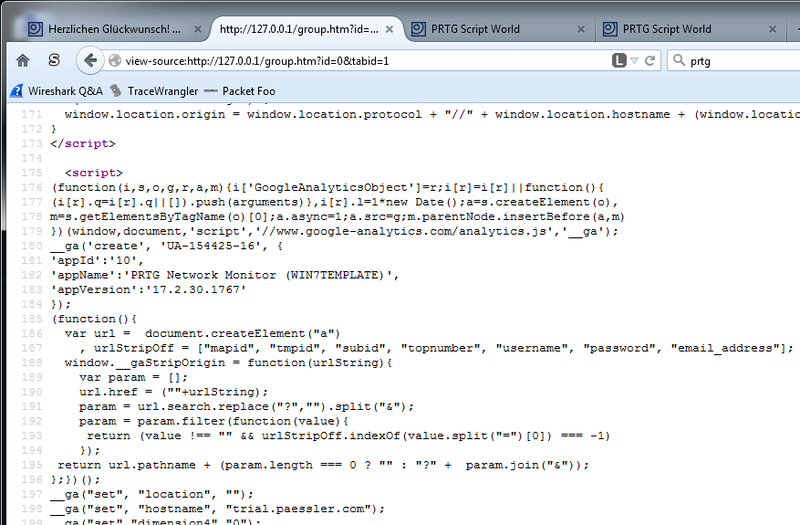 Fun fact: I looked up PRTG on Shodan and sure enough there are some network monitors accessible on the internet. Not terribly surprising considering so many things are these days. BTW Jasper, I saw you at Sharkfest this last week, enjoyed your talk! Thanks, Dan, glad you liked it! 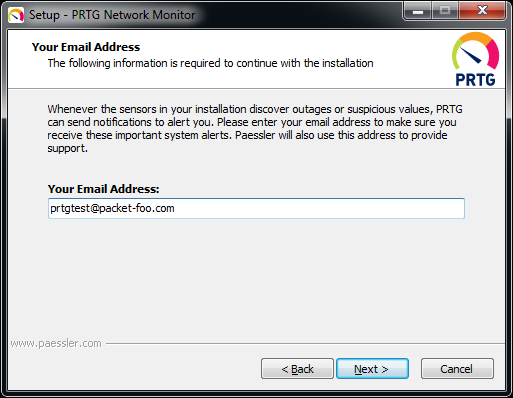 Absolutely PRTG one of the best Network Monitoring tools i’ve used! 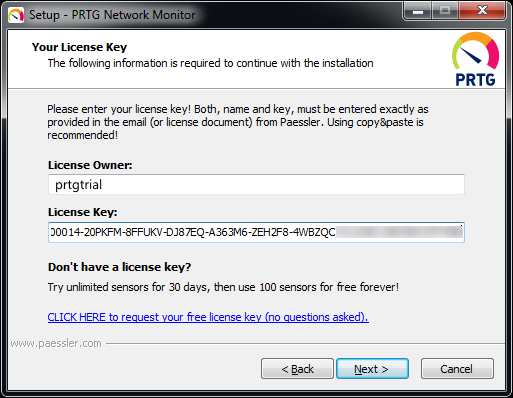 PRTG is the one for small scale networks or monitoring Server machines! 100 mails first 15 min.. very difficult to remove account. Yes, the flood of mails is a little too much (even though I can’t remember it being 100 mails :-) ) – but at least for me it all went across my own mail servers so I could live with it.